Have you ever imagined yourself invited to a state luncheon? What food do they serve their? Where will you be seated in relation to the host, the state, or rather the head of state? Wait, how do you even receive the invitation - is it by post, by courier or do they call you to collect it at a state office? How does the invitation look like? On Monday, all this questions were not lingering in my mind. After all, would the president be that insane to invite me to a state luncheon? Well, maybe in my line as a journalist, I just might as a nondescript stakeholder in the process - the people who need to make the information public. However, not any time soon - I had not received an invite to any such event. I took the KBS bus as I had many times before, and as I would do again on Wednesday. As usual, I paid the usual fare, and the driver made the usual illegal turn into a one way street. As usual, or almost as usual, was dropped off next to Equity Bank's technical headquarters. What was different this time were the two traffic police officers who directed the bus stop a few metres ahead, rather than on the Kenya Road junction. Having arriver earlier than usual, I decided rather than go straight to Crowne Plaza, I decided to venture into the open food parlour. The parlour was set under a tent, to shield the clients form the African sun. Taking into consideration the kei apple fence on one side and the wire fence on the opposite side of the parlour, strong rains would be way beyond what the shelter could handle. 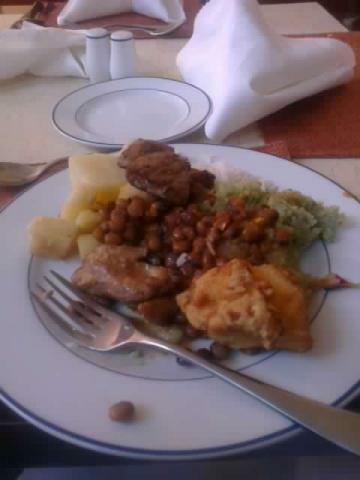 Three ladies approached me, "karibu lunch customer". Despite it been almost past 3 o' clock, there were still several people in the midst of plates of ugali and roast meat. I headed for the fruit lady whose stall I could see. I was hungry, but I also expected to have some sort of food at Crowne, so light eating would do. I ate the fruits, and gave her the fifty shilling note that the conductor had given me as change, and she returned a twenty shilling coin. I made my way down Kenya road, a road that made me wonder whether the constructor had intended it to be a one way street, given that two vehicles could not feet on the uneven, patched strip of tarmac. My shoes would be dusty by the time I got to the hotel, I could not fight for the tarmac with vehicles going either way. However, there were no vehicles, just police officers, one after another. Most were traffic officer, one was an OCS, with his Khaki uniform. None of them stopped me, despite the black bag on my bag. I could tell that an important dignitary was around due to their presence. The hotel parking lot next to the road had several police cars, not the usual many Toyota Mark II models. Even the usual taxi drivers were missing. The guards did not let me through as usual, rather questioned what my business in the hotel was. I told them I was here to meet executives from a leading mobile manufacturer- not what usually brought me to the hotel. They had not had of it, and directed me to the concierge. The concierge directed me to the reception. I walked over to the reception, careful to avoid the red carpet. The reception was not aware of such a meeting and could not get through to the sales office who arranged such meetings- they were all busy ensuring the president was having a nice lunch. I called my hosts, and they told me they were on their way. I decided to wait at the hotel lobby, careful to choose the side away from all the action. I sat opposite a camera man. Several police officers would pass by - regular, OCS and the motor cycle riders in their tucked-in-boots khaki trousers and blue shirts. A man sat behind me. He had a medium bulging tummy that gave his body a rounded shape, and must have been in his late fifties or early sixties, and asked which media house I was from. "CIO East Africa," I told him. He commented that it sounded dangerous. "CID?" I asked, which he replied in the affirmative. I explained who CIO East Africa was. He asked me if I had lunch, in Kikuyu.No. He had an extra voucher, did I want it? I explained that I had a 4 o' clock meeting, and would probably be having tea with my hosts. This was in between a couple of incoming calls. He said he would look for someone else to give the voucher to. After giving it more thought, and been an African who liked food, just like Ali Kiba, the Tanzanian musician behind Usiniseme napenda kula, I decided that the voucher would do no harm given that I had a few minutes to spare. Real Africans do not reject food offers - not when millions are starving in East Africa's worst drought in 60 years. The voucher read "Beverage Voucher:State Luncheon". It was a square piece of paper which had been part of a normal A4 leaflet. The print was broken and was unarguably a photocopy. I handed it in to the lady manning the restaurant by the pool side,a restaurant familiar to many a Nairobi journalist. It was usual to dine at the restaurant after covering a product launch, or an important announcement. The lady asked if I had a meal voucher, my voucher was just a drink voucher. Her supervisor who was standing by said that it was OK,I could have the food. I proceeded to the buffet selection, and proceeded to server rice and fish amongst other dishes. Over my meal, I noticed the only other people in the restaurant were state security officers. A police officer in his blue shirt and navy blue trousers was seated at another table opposite an OCS in his khaki uniform. I wondered why he chose spotted white Made in China socks rather than less noticeable black ones. Two National Security Intelligence Services officers sat behind me. They always stick out like thumbs in their suits, some oversize, with the tell tale bulge of guns on the right back of their waist. I wondered if there were left handed NSIS officers with bulges on their left sides. The waitress clearing my table seemed curious as she studied my out-of-place look. She would even be more shocked to spot my familiar face at a different lunch a day later at the same restaurant. Probably she will come to discover my line of work, probably she will never read the published lines of my work. She looks like the wife of my friend, light, and with a face that bears the marks of pimples that would never let it go without a blemish, and her silky black weave. Later two female police officers , white blouses and navy blue trousers walk in, they are not requested to present vouchers. The lady manning the restaurant smiles and welcomes them instead. I go back and thank the man who gave me the voucher. I am surprised to learn he is Uhuru Kenyatta's guard. Uhuru Kenyatta, the deputy prime minister and the finance minister is also at the event. We venture into a bit of politics, how the government is building roads. One of the top government head is popular for populist but less known for his work in ministries and his consistuency. The president was a contrast with all the roads build. Uganda had a road to Southern Sudan because Museveni's directives were rarely questioned. In Kenya, questions had to be asked and answered before road construction commences. The president, the deputy prime minister and Glaxo Smithkline were of course in a different meeting room. The restaurant was reserved for the rest of the detail. I wondered what Glaxo Smithkline had offered the president to lure him out of state house - a feat he rarely accomplishes -, and to have him having lunch at such a late hour. Contribute to the Kenya Red Cross to help a family in need as Kenya, Somalia, Ethiopia face a drought, war and refugee crisis. You can donate through M-PESA pay bill to number 10,000 and enter FEEDKE account name. You can also visit their website (www.kenyaredcross.org) to pay via credit card or bank transfer.